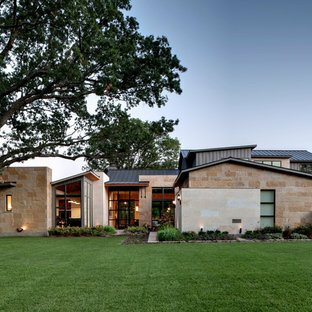 Photo of a traditional two-storey white exterior in Dallas with a hip roof. Design ideas for an industrial two-storey exterior in Sydney with metal siding. 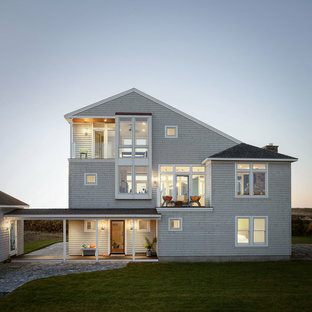 Beach style grey exterior in Portland Maine. 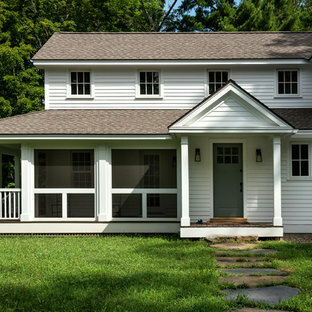 Photo of a country white exterior in New York. Inspiration for a country two-storey red exterior in New York with wood siding and a gable roof. “Can you make this house livable for us?” This was the seemingly innocent request posed to the architects by the new owners of this house. It was a cartoon dwelling, an asym- metrical structure blemished by several poorly constructed additions that would feel at home in a coloring book. Despite these difficulties, the building was strangely interesting -- like an underdog you felt compelled to root for. So it started with the basics. The house was stripped down to its simplest saltbox shape. This began to give direction to the massing of the addition. New openings brought a sense of order to the elevations. Dormers, clad in the same material as the roof, were used to make more efficient use of the sec- ond floor spaces while emphasizing the original lines of the house. Deteriorating stucco was replaced and tinted a moss green. A plinth of locally quarried stone wraps the base ofthe structure, anchoring it to the earth. 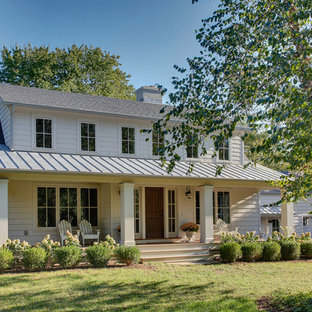 The large front porch engages the street with a more welcoming face. Cooking meals together is a vital gathering activity for this famil. The kitchen space was moved to the center of the house as an organizing element and to reflect this impor- tance. Reclaimed oak cider vats were used as flooring throughout the residence. Virginia soap stone countertops further echoes the desire to reconnect this house back to indigenous materials and the local culture. This house is no longer a caricature. 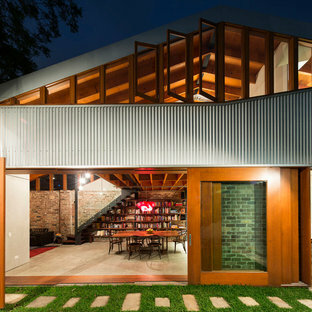 It has found its roots and become a modern, livable dwelling, without losing its quirky charm. All photos by Hoachlander Davis Photography. Photo of a traditional exterior in New York. Photo of a mid-sized modern two-storey white exterior in Seattle with mixed siding. “Can you make this house livable for us?” This was the seemingly innocent request posed to the architects by the new owners of this house. It was a cartoon dwelling, an asymmetrical structure blemished by several poorly constructed additions that would feel at home in a coloring book. Despite these difficulties, the building was strangely interesting -- like an underdog you felt compelled to root for. So it started with the basics. 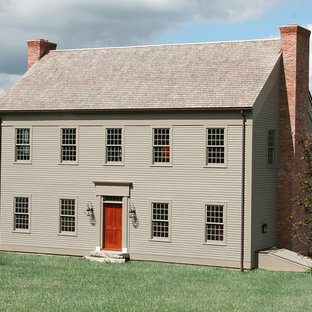 The house was stripped down to its simplest saltbox shape. This began to give direction to the massing of the addition. New openings brought a sense of order to the elevations. Dormers, clad in the same material as the roof, were used to make more efficient use of the second floor spaces while emphasizing the original lines of the house. Deteriorating stucco was replaced and tinted a moss green. A plinth of locally quarried stone wraps the base of the structure, anchoring it to the earth. 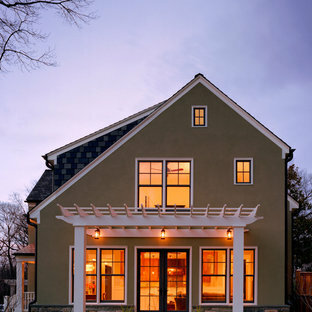 The large front porch engages the street with a more welcoming face. Cooking meals together is a vital gathering activity for this family. The kitchen space was moved to the center of the house as an organizing element and to reflect this importance. Reclaimed oak cider vats were used as flooring throughout the residence. Virginia soap stone countertops further echoes the desire to reconnect this house back to indigenous materials and the local culture. This house is no longer a caricature. It has found its roots and become a modern, livable dwelling, without losing its quirky charm. All photos by Hoachlander Davis Photography. Inspiration for a country one-storey exterior in Adelaide. Located on a narrow lot in The Historic District known as Old Wethersfield, this tall and narrow house includes almost 4000 square feet of living space on 4 levels. The open floor plan and modern amenities on the interior of this with the classic exterior and historic walkable neighborhood location gives the owner of this new home the best of all worlds. This is an example of a country two-storey white exterior in Burlington with wood siding and a gable roof. 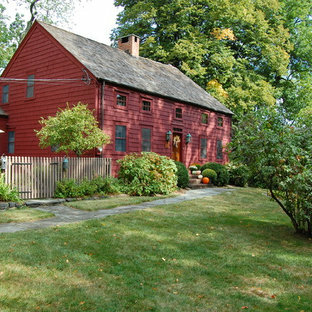 Photo of a country exterior in New York. Photo of a large transitional grey exterior in New York with three or more storeys and wood siding.